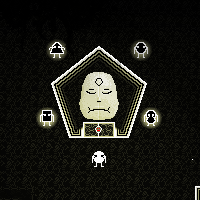 Ossuary is a game about a place where people do not belong but have chosen to stay. It’s a place with strange rules and it has an insidious and terrible effect on those who exist there. Are they even still alive? Is it Hell? Ossuary is a game about strange people. You can talk to them, and each one has an odd perspective twisted by their time in the Ossuary. Some of them want your help, but is it for the right reasons? And if you help them, will they give you what you want? Ossuary is a game with the perspective of an old-school console RPG but with the style of challenges you’ll find in an adventure game. Instead of an inventory of objects, you have an inventory of sins, which you use to corrupt the people you meet. Ossuary is a game about virtue. The people of the Ossuary pursue order and virtues, but they’re misled. The sins you find help bring people into their true nature, and order for order’s sake is no virtue. Ossuary is a dark and funny game. The atmosphere is horrific and the characters are obsessed with control and death, but the writing is wry and even silly at times. Ossuary is a game with creepy black-and-white-and-red pixelly art and haunting music and sound. Ossuary is a game about a place of bones.